The Drone Hive is a cruiser-class ship for the Substrate. Spawns drones with moderate damage against all targets, including air. Drones can be shot down with anti-air weaponry. This area control cruiser has an onboard autofactory that maintains swarms of drones. The ship seems unassuming from the outside, but as soon as it engages in combat, its terrifying worth is easily demonstrated. Drones deliver good damage against all targets including air, but are vulnerable to anti-air weaponry. If drones are destroyed, they will not be replaced until several seconds later, making the Drone Hive vulnerable. The Drone Hive can not stand up against dedicated anti-cruiser units. Drone Hive does generic but reliable damage, and is particularly good early game when its counters are not in place, namely AA damage and healing/regeneration units/buildings. Drone Hive can be bullied by frigates if their DPS is big enough to shutdown the Hive before the Drones do the same to them. 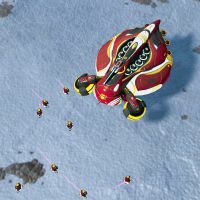 Drone Hive is soft-countered by anti-air frigates as well as Medic and thus should not be too aggressive towards them. Drone Hive is often mistaken as Substrate tier 2 anti-air cruiser. However, this is not true as Drone Hive is actually rather ineffective, having no AoE and short range compared to dedicated anti-air units. This page was last edited on 20 February 2019, at 10:39.